Mount St. Helens is located in southwestern Washington and is about 50 miles northeast of Portland, OR and 96 miles south of Seattle. Mount St. Helens has an elevation of 8,364 feet after the May 18th, 1980 eruption. The mountain was originally 9,677 feet. St. Helens is one of the volcanic peaks that span the Cascade Range of the Pacific Northwest. 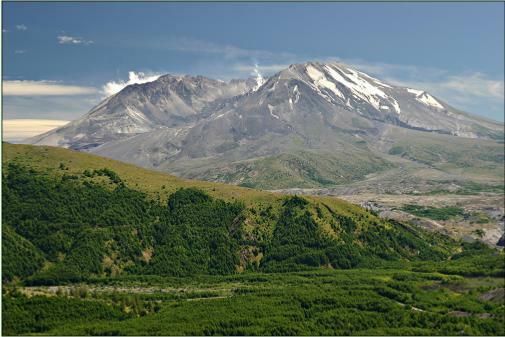 St. Helens is a stratovolcano or composite, which is alternating layers of lava flows, ash, and other volcanic debris. Composite volcanoes have a tendency to erupt explosively and pose considerable danger to nearby life and property. On May 18, 1980 the eruption of Mount St. Helens marked the re-awakening of a 40,000 year old volcano which had been dormant since 1857. The eruption was preceded by two months of intense activity that included more than 10,000 earthquakes and hundreds of small steam blast explosions. The outward growth of the volcano's north flank was more than 80 meters. A magnitude earthquake of 5.1 struck the volcano at 8:32 a.m. on May 18th, 1980 which triggered the destructive eruption of hot gas, steam, and rock debris at speeds of 1,100 kilometers per hour. Temperatures within the blast reached as high as 300 degrees Celsius. Snow and ice on the volcano melted, creating torrents of water and rock that swept down river valleys leading from the volcano. A massive plume of ash spewed 19 kilometers into the sky. The prevailing wind carried about 540 million tons of ash across 57,000 square kilometers of the Western United States. Fifty-seven people were killed and 250 homes, 47 bridges, 15 miles of railways and 185 miles of highways were ravaged. This eruption was the first volcanic eruption in the United States since 1914. There are many points of interest at Mount Saint Helens which include Ape Cave and Lava Cave Forest, Climber's Bivouac, Clearwater Overlook, Cowlitz River Views, Coldwater Ridge Visitor Center, Debris Avalanche, Elk Rock Viewpoint, Harmony Basin, Independence Pass, Johnston Ridge Observatory.